It's time for a new challenge over at Scrappy Moms Stamps! The challenge this time is called "Out of the Box". For my adorable little box, I cut the Haunted House from the SVG Cuts - Gimme Candy SVG Kit. I changed up the roof panels slightly by welding the lower layer of the SVG Cuts - Lover's Lace to the rectangle roof pieces. I cut the heart shaped tag from the SVG Cuts - Tags Galore set. It's fun to look at files that are intended for one holiday and see if you can make them work for another. The pretty pink and red paper is from the Echo Park - Love Story collection and the sentiment is from the Scrappy Moms Stamps set - Love Notes. Head on over to Scrappy Moms to play along with our fun challenge for your chance to win some new stamps! 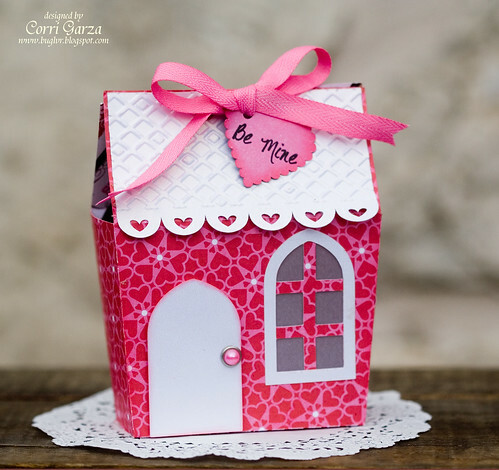 Your little house is so adorable Corri! SOOOO pretty!!! LOVE how you made a Halloween house into a Valentines house...really clever!! !